Hey, everyone! 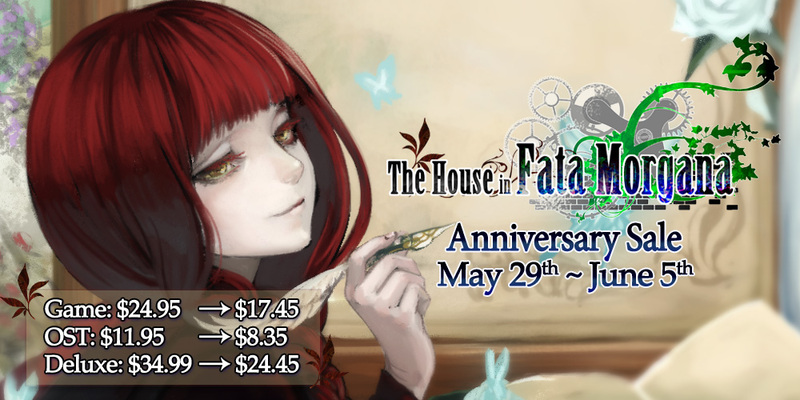 BlackDragonHunt here––translator and programmer for the English release of The House in Fata Morgana. It’s hard to believe it’s already been a year since the game came out! It feels like it was just yesterday. It was a long series of accidents that found me working on Fata Morgana, and I’m so happy to have been given the chance to help bring such a beautiful, heartrending tale to English-speaking audiences. It’s been a huge honor, and I can’t overstate how amazing the reception has been. The outpouring of love from all directions has been absolutely incredible, and every time I see someone new talking about the game, it warms my heart and makes all the long nights Rito and I spent poring over the script that much more worth it. Work on the prequel/side story/fandisc A Requiem for Innocence is still in full force––sorry to everyone I’ve kept waiting, and thank you for your patience! We really hope to be able to put that in your hands soon! « D.S. – Dal Segno – Now Available for Preorder! Absolutely adored this game and it was my favorite of 2016. It’s def going to be one of my all time favorites and I encourage everyone who likes a good story to pick this one up.